The air was hot. Thick with dust waltzing through the camp, billowing the UNHCR (United Nations High Commissioner for Refugees) branded tents like sails. The heat of midday beat the men and women back to the shade of their sailing tents. The children not knowing better ran about in the sun, gingerly climbing on the red hot, stainless steal climbing frames, trying not to get burnt, playing with the heat. The Domiz refugee camp, one of many that dots the skirt of Syria’s current borders, currently houses some 4000 Syrian Kurds. It braces for more, those escaping the violence of failed politics, of civil war. Khalil escaped Damascus three months ago, with the members of his family who could bear the weeks of traveling through the Syrian desert heat, through the snipers waiting at the border. 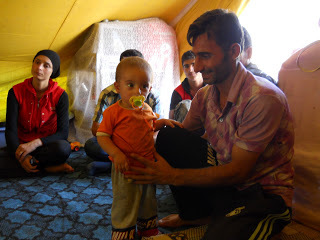 He sat holding his youngest wide-eyed child, in his family’s billowing tent. Khalil and his family had offered what little they had to us “Westerners”, honoring a time old pillar of Islam, hospitality for the stranger. “Where are your elders?” we asked, surrounded by young men and women nursing their fidgeting children. “Their future is the land,” Khalil mused. They will not leave home. Their parents, their elders, will accept their fate and die where they where born, where they have lived and loved, laughed and cried. Khalil and his family cannot find a reason to return, whether or not there is eventual stability in Syria, or its currently autonomous Kurdish region. After decades of oppressive dictatorship, plus the hundreds of years of Ottoman rule, the future is ominous for Syrian Kurds. A dream I thought, as I sipped the ice-cold water Khalil had handed me, one from the heart, one with merit, but a dream nevertheless. Some times, In’shallah (God willing), dreams do come true.